Solar-powered homes are becoming more commonplace, and are an excellent step in the right ecological direction. That said, there are some aspects to consider if you’re thinking about investing in solar energy. Read on for some salient points about living by the sun. As solar power has grown in popularity, the government has introduced incentives to help homeowners combat the once-high costs of purchasing and installing solar panels. And companies are springing up to rent you panels and cover the cost of installation. This means that your initial costs are smaller, but also that those third party companies reap the government incentives and may not always maintain strong relationships between you and your utility company. 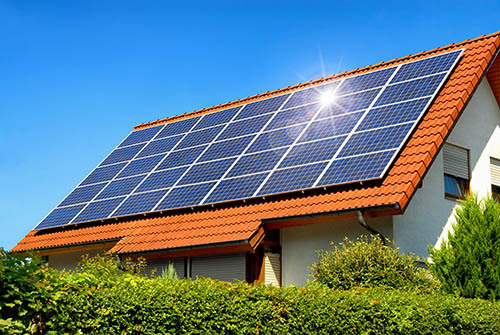 Roofs are the primary locations for solar panels, particularly on homes. Ensure that your roof has enough strength for the added weight of the equipment, and enough space for the proper placement (away from the edges, for example). The equipment comes with a lifetime guarantee so if the roof it’s on is already old, consider updating it before installation (which is an extra but necessary cost). A solar-powered home is all about location, location, location. Watch for tall and shady trees, or for high buildings that will shadow your panels and decrease or prevent their output. Look forward, too are there any plans for development in your neighborhood that would introduce such impediments in the future? The most obvious hiccup with solar power is that bane of a sunny existence: cloudy days. Location has influence here too: the climate of your area will determine how many panels you’ll need, where you’ll need to place them and how much energy you’ll be able to glean in each season. There are batteries you can purchase for collecting and storing solar energy but they’re still an expensive option. And solar power is still somewhat unattractive in the global economy because of how variable it is. Fossil fuels are more dependable, and therefore more marketable, than an energy source so tied to the weather although that looks to change if solar energy continues its rise in popularity with the masses. All things considered, there is a deep and growing draw to solar-powered homes, but don’t enter into anything without looking at all sides of the equation. If you have questions, or want to know more about how solar energy works in your neighborhood, contact your local mortgage professional.